Join the discussion on our forums! Come discuss Wicked Skeleton over in our dedicated Wicked Skeleton discussion topic. This is definitely in the top 10 worst cards in the entire game. He is saying it won't be played. It will only show up from those spells. That is good for you if you devolved your opponent and bad for you if you evolved yourself. It will always be what you 'volve into, never what you 'volve from. Could be used in Druid with Living Mana. If you get 7 out from Living Mana and then manage to trade them all, you'll end up with an 8/8. 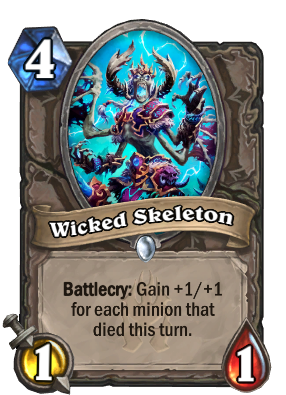 When you use living mana you don't have mana crystals to play wicked skeleton, and if you trade them you just gain empty ones, so no. only great after a board clear like Hellfire or something. Problem with doomsayers here is that if he has a decent number of minions to justify priming the skeleton, then he probably has enough minions to kill the doomsayers. Unless of course it’s safe behind taunt, or frost nova. No? interesting idea. potentially could be a 15/15 for 4... if somehow the whole board is full and then gets instantly cleared using at most 7 mana... 11 mana with coin and two innervates. which is almost never going to happen. Honestly it should've started as a 3/3 but then the 4 mana 5/5 that makes you remove cards from the top of the deck when you play a card weep even harder.